I’m Rachael Desztich, the designer and woman behind Rachael Harrah. I live in Los Angeles and am a mother to a 3 year old son, Wynn, and a 2 month old daughter, Mar. Inspiration is all around, but it comes to me as a feeling - of how I want to feel when I get dressed and go out into the world. Right now that's ease and presence. I am also very inspired by motherhood and how this role can inform the progression of a women’s wardrobe with pieces that are beautiful but also functional and easy to wear. Rachael Harrah is a distillation of foundational pieces designed for simplified dressing. 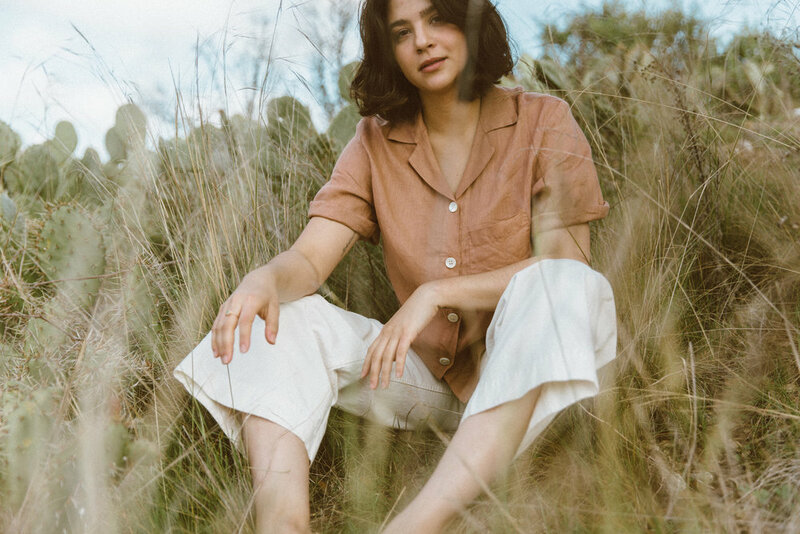 The clarity and vision for what would become Rachael Harrah came after I had begun to embrace a more simple approach to life - paring down ‘stuff’, dressing in only my favorite pieces (which meant wearing the same thing pretty much everyday), and cooking with simple whole and natural foods. I started to notice more and more that it was freeing space in my mind and in my day. Simplicity made me feel good and made life feel easier and more fulfilling for me. My ‘a-ha’ moment came from there in the form of a white long-sleeved button-down shirt. I had been wearing a white shirt with jeans for months and would tell my friends it was my “mom uniform,” which actually just meant it was my uniform. So I wanted the perfect one — one that could quite literally be worn everyday for almost every occasion. One that made me feel put together, yet relaxed, and wasn’t overly crisp or business-like. That would carry me from client meetings, to pre-school pick up, to family dinner, to meeting friends in the evening. The vision for this piece is what lit the spark, so to speak, for the line. With Rachael Harrah, I’m interested in creating space in life for more living through the act of dressing. In crowding out what doesn’t serve us, with what does. These pieces are made to wear. They are made for women to feel like her best self — at ease, confident, for every season of the year, for every season of life. They are vessels for spaciousness and freedom, that enable her to focus on what matters most. I want her to feel like she can buy less with them in her closet. The Long Sleeve will forever be my favorite as it is so classic and versatile. For spring + summer I love the Short Sleeve which brings the same everyday feel to warm weather wearing. I'll be re-stocking these soon! And I fell in love this year with my newest piece, the Overalls; which I wore daily during my pregnancy with Mar and now postpartum as a nursing mama. I believe in addressing each step of the garment making process with mindfulness. I partner with ethical, women owned and operated small factories based within miles of my home in Los Angeles. I know my sewers by name and visit them often. Fair wages and safe working conditions will never be negotiable to me - people matter too. I also use only natural fabrics and low impact dyes, and produce in small batches, to minimize waste and my environmental footprint.